The products were gravity filtered. After filtering it was observed a deep blue liquid and a white powder. 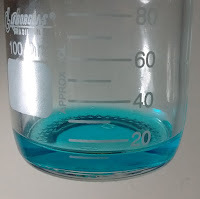 The liquid was cooper sulfate and water, therefore, the calcium carbonate was mixed with iron and cooper salts as well, that gave the mixture a greenish-blue color.